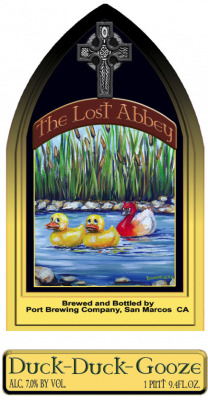 San Marcos, CA, — With the upcoming release of Duck Duck Gooze, The Lost Abbey has decided to go in a new direction in releasing this beer to the public, with the emphasis on ease and getting the beer to as many people possible. Taking a page from some of the successful releases of our brewery brethren throughout the country, our mission is to reestablish the beer as the focus and not the trials of waiting in line. Duck Duck Gooze will be sold in advance using Brown Paper Tickets prior to Labor Day weekend, with 4 different sessions of pick up times (Two Saturday and two Sunday). If beer is purchased and not picked up during the designated pick up session, the beer will be surrendered back to the brewery. Online sales should commence in early August. There will be a six bottle limit per person, any duplicate purchases will be rendered null and void. In keeping with tradition, Duck Duck Gooze will be packaged in 750 ml cork finished bottles, the same as the original batch. More info, including the exact date the bottles will be put on-sale, will be released in the coming week.